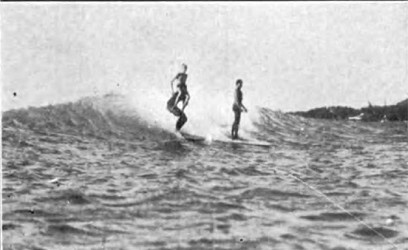 Lorrin P. Thurston : Surf-Board Riding in Hawaii, 1915. 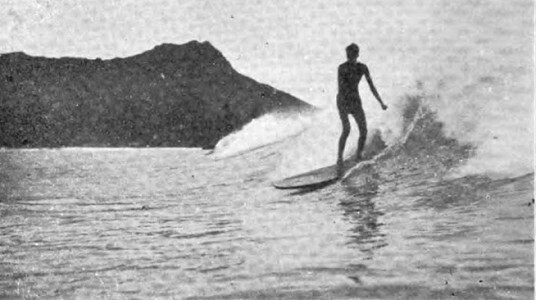 Thurston, Lorrin P.,:Surf-Board Riding in Hawaii. Previously printed as Riding the Waves on the Honolulu Beach, Sydney Mail, 7 January 1914, page 26. 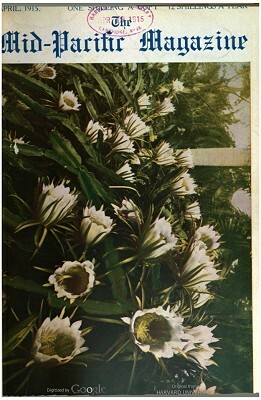 First published inThe Hawaiian Gazette, Honolulu, June 28, 1907, page 6. Accredited as Alexander H. Ford: George Freeth, Spinning in on a Swift One. describing how it was done. Since then the methods of surfing have undergone some changes. complete control of the board. The first thing in learning how to ride a surf-board, is to get a good board. and a half to two inches thick. A regular man's sized surf-board is eight feet long by about two feet wide and two and a half or three inches thick, weighing from thirty to sixty pounds. 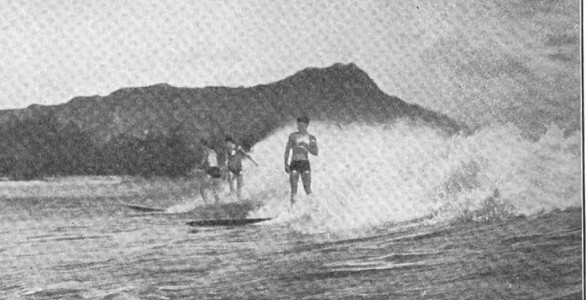 The old Hawaiian boards were longer, narrower and thicker. These very big boards were used for the big surf where it first breaks. A few boards a foot and a half wide and about nine feet long are now used at Waikiki. They are good for going straight before the wave, but are not good for "sliding" along the face of the wave, as hereafter described, which is the most interesting and exciting part of surfing. The board is rounded off in front, being widest at a point two feet back. From here it tapers to the stern, where it is usually about eighteen inches wide. Some of the newer boards are as narrow as six inches at the stern. The amount of taper is chiefly a matter of taste. On the upper side the board is perfectly flat. On the lower side, the board is left its full thickness just in front of the middle. From this point it is tapered toward the bow and stern, at which points the board is from half an inch to an inch thick, being thinnest at the bow. It is also rounded off toward the sides, leaving no sharp edges. The boards are all made of sugar pine, white pine or California redwood. They are shellaced or, what is better, varnished with "Valspar", to keep them from becoming watersoaked. This also makes them slide thru the water easier. A good board costs about four to five dollars. Boards can be rented at the beach for 25 cents for the afternoon. A new-comer should get some one who knows how to surf to help him pick out a board before he buys it. Most beginners think that they should first learn on the small waves in shallow water. My experience is that one should begin in deep water, if he is a good swimmer- and he should not try to surf at all if he is not a good swimmer. He should not, however, begin with the biggest waves, but with medium sized ones. The chief reason for beginning in shallow water is that one is afraid to go into deep water; but there is nothing to be afraid of if one is a good swimmer. A few lively experiences will take the scare all out of one. It is much harder to get started and to keep going on a small wave than on a large one. In shallow water a person gets speed on his board by shoving off from the bottom instead of by paddling. The result is that when he goes out to deep water, where he has to paddle to get up speed, he has to learn all over again how to get started. water should guard against is trying to ride the very big surf at first. It takes long practice to learn to handle a surf-board on a big wave, and it is dangerous for a beginner to try it. He will soon learn, however, how to let them go by. The one great fault with most beginners is that they get too far back on the board, and because of that fact, do not "catch" a wave. body drag in the water. The correct position is to lie flat on the board in such position that the front of the board is just out of the water, then paddle with your hands, keeping your feet straight behind you. Kicking the feet helps very little and makes one very tired after a few minutes. Then if the surf is not too big, go out to where the other surf riders are. Get right in the middle of them and you will be sure to be in the right place. A usual mistake made by a beginner is to get away off on the side where the waves are not steep enough, and as a result, he cannot catch the wave. When in position, point your board toward the shore; then sit astride of it as the others do, and wait for a wave. Do not go for a wave that others do not go for, because they know which waves are good and which are not. The best time to catch a wave is just before it breaks. A novice should never catch a wave either before or just after the wave has broken, for it will be so steep that the board will stick its bow in the water and dive under. If a wave happens to break as it gets to you, and is not very big, si rile back on the board so that the bow will be well above the surface. The wave will then pass over you. I will speak later of going thru big waves. Even one who knows how to surf will often get into trouble if he tries to start on a just breaking wave as the following incident will show. About six of us boys were all waiting outside for big waves. There was a fine big surf running. 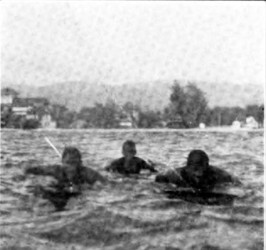 Soon a wave came along which was nearly breaking, so nearly all the boys let it go by; but one gallant youth named Podmore, familiarly known as Poddy, started to paddle for it. We all yelled for joy for we knew that he would duck on it. and I sung out to him,-"If you catch that wave you won't stop till you hit the bottom". He told me afterwards that he had just about decided not to go, when he heard me yell: but then he decided to catch it anyhow and show us he could ride it. All this had scarcely taken three seconds. 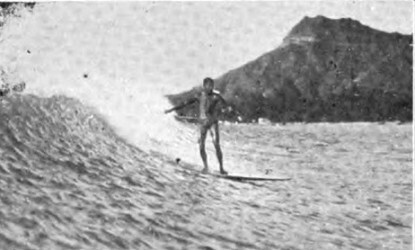 The wave caught up to Poddy, and his board mounted up, up, up until his feet reached the top of the great clear blue wave. Then the wave broke, the top going completely over Poddy's head, and Poddy and his board turned a graceful somersault in the air; then the wave got by us so that we could not see. further in his board was thrown way up in the air. We all howled for joy, for he had taken a diploma, or in other words his board had ducked under. It is all right for a thing like this to happen to one who knows how to surf, but with a novice it might turn out far differently, for a greenhorn caught in a falling wave at the first break is liable to lose his board and be rolled over and over, filled with water and scared stiff if nothing more. A novice may suffer from sunburn, especially if he surfs in the morning from nine to twelve, or in the afternoon before three. The best time to surf I think, is from three to half past five in the afternoon; although after one gets used to it. he can surf all day long. All sorts of fun will be made of a novice, but it is all good natured and should be received in the same way it is given. A novice may have his board dive, or "duck" as it is known, many times, but experience will remedy that. The neck and back muscles will ache a lot at first, but they will soon be toughened so that he can surf for hours without getting tired. The waves are hardly ever the same and in a small surf not much skill is needed to pick out the right one: but when there is a big surf one must be quick in thought and action. 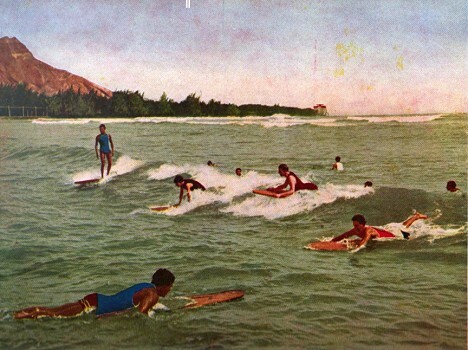 There are five different places at Waikiki where surfing is done. In each place the surf acts differently. First, there is what is called the "small surf" opposite the Outrigger Canoe Club and the Seaside Hotel grounds, extend-ing out from the beach for several hundred feet. The water is only three or four feet deep. The waves are generally small and it is suitable for small boys. Second is the "Canoe Surf", so called because the surf riding in outrigger canoes is done here. It is across the middle of Waikiki Bay. 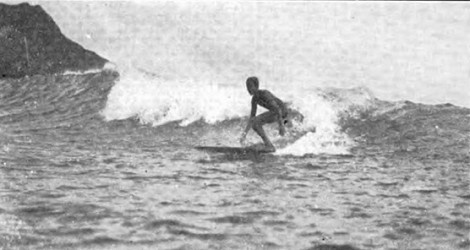 Duke Kahanamoku before a wave. Initially appearing as an advertising logo for A.R. Gurrey Jr's studio in Honolulu, the photograph appeared on the cover of the first edition of Ford's The Mid-Pacific Magazine in January, 1911. 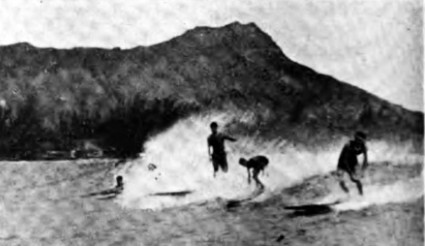 It was later included in Gurrey's Surf Riders of Hawaii, Honolulu, 1911-1914.
waves break from about a quarter to three-eighths of a mile from shore. When the waves are very heavy they break nearly a mile out. The water is six to eight feet deep inside and twenty feet and over at the outer break. This is where most of the surfing is done. Beginners can go to the outer break when the surf is light, but should go only about half way out when it is heavy. Surf of the usual size will carry a rider half or three-quarters of the way to the beach. Sometimes when a wave is just right, a rider is carried clear to the beach, but this is seldom. Third is the "Queen's Surf", so called because it is just opposite Queen Liliuokalani's beach house east of the Canoe Surf. It extends out about a quarter of a mile from shore. The peculiarity of this surf is that the waves are in deep water until they strike the reef, which rises suddenly. The result is that the surf is high, steep, quick in breaking and runs much faster than at Canoe surf. 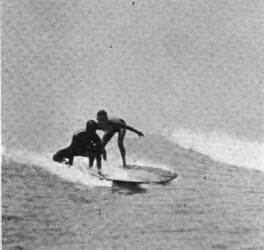 Beginners should not attempt riding at Queen's surf, as the waves are so steep that usually one cannot come straight in, because the bow of the board will be forced under water and duck, leaving the rider to be rolled over and over and well pounded. The rider should "slide" diagonally along the wave. By doing this one can surf clear to shore, standing, when the surf is running good. Fourth is "Castle Surf", toward J. B. Castle's big house, on the east side of Waikiki Bay, outside of the reef. The surf only breaks here in very heavy weather. The water is from fifteen to twenty feet deep and the surf is very big. Only a few of the best surfers ever go here. Fifth, "Popular Surf", so called because hardly anybody goes there. But of late it is becoming a little "popular." It is on the west side of the bay. to "slide" to the right, always, to avoid hitting them. Six years ago they stood up on the surf-boards and came straight in; now they go off on a slant, sliding diagonally along the front of the wave. When the rollers run high. An early example of the negative being flopped. Diamond Head should be the the surfer's left. straight ahead at a right angle to the wave. At this point it may be well to tell about how to stand on a moving board and when to begin to slide. Sliding standing up can only be done when one is shooting along the front of a wave which has not yet broken. Long steep waves are needed. When one catches a steep wave, one must turn the board and begin to slide just as soon as the board starts down the face of the wave. It is best for the greenhorn to get the board to sliding first and then to stand up. An expert turns his board and stands up at the same time. When a wave is very steep and just about to break one must slide down the face of the wave sideways. a breaking wave without ducking. Standing up on a board is not hard, after one learns how to ride lying down. To stand up, wait until the board is going good and fast, then take hold of both sides of the board, and pull yourself up so that you are crouching on your knees; then draw your feet up under you, and then stand up and let go of the board, keeping one foot a little in front of the other. Do not spread the feet much or you cannot steer the board and it looks awkward. Stand a little back of the middle of the board. Keeping one's balance is awkward at first, but it merely requires practice. Some greenhorns have no sense at all and one day I saw one wait till the wave was right behind him and then try to stand up. I asked him what he was trying to do and he said that he was trying to stand up and be ready when the wave hit him. He did not seem to know that the board, which would just keep him afloat while he was lying on it, could not hold him while hr was standing up, unless it was moving rapidly thru the water. While lying down on a surf-board it may be steered in two ways. First by dragging one's hand in the water. To go to the right, drag your right hand; to go to the left, drag the left hand. The second way is steering with one's feet. This is the commonest way of steering and is done in the same way as steering with one's hands. To steer the board when standing up, the board must be tipped slightly, by shifting one's weight toward the side one wants to go. The drag causes the board to turn. While learning how to steer standing, the beginner may steer by leaning down and dragging his hand in the water on the side he wants to go; but this is a poor method as he is liable to lose his balance. Stopping may be done in two ways: by dragging one's hands and feet, or by sitting astride of the board and dragging your arms and legs. This last way is the best I think. On a good wave that all have caught. enough to stop, but in a big surf it is sometimes hard to do so. With practice one can get so that he can stop or steer very quickly and have full confidence in himself. At first the sight of a big wave with the edge just feathering up against the sky is enough to scare anyone; but you soon get used to it. half a mile from shore. Duke Kahanamoku and a lot of big boys were there. At first there were no big waves, but pretty soon it looked as though the horizon was rising up into the sky. I had never seen such big waves and was never so scared in my life. When the first one came I paddled for it, but when I got on top, it was so far down to the bottom in front, that I stopped and slid down the back of the wave. I also caught the second wave, but when I got on top it was higher than the first and I slid out behind again. The third wave was the biggest of all, but I decided that it was time to get away from there, so I just hugged my board as tight as I could and let her go. The wave broke all over me; but I hung on and kept going and the wave carried me nearly to shore. This wave was so wet that it dampened my enthusiasm for big wave surfing for some time. After gaining confidence, with some practice, I became able to come in standing up on this kind of a wave. Big waves usually come in bunches of three or four, but sometimes ten or twelve will come in at a time. To go thru a big breaker one must paddle straight for the wave as hard as you can - then, as the wave hits you, clasp the board with both hands, crawl up on the front of the board, thereby sinking it and keeping the bow under water. In a few seconds the wave will pass over and you will come up behind it in smooth water. This is really the only safe way to go thru a big wave. Nine times out of ten one will be able to get thru a wave in this manner, although sometimes the board may be pulled away from a novice. If so, it may be carried several hundred feet shoreward, when there is nothing for him to do but swim after it. There is one thing a novice ought to remember, that is to keep paddling all the time when he is inside where the waves break so as to get outside as quick as possible. Jack London describes another way of going thru a breaker, viz: to sink down your arms' length, holding the board at the back end and pointing it toward the wave. but a big breaker would float the front end up and be liable to throw in over backwards, tearing it away from you with a good chance of its striking you a heavy blow. If one loses his board, the way to pass thru breakers is to simply sink down under water as they come along. If the wave is extra large it is better to meet it and dive under, thus getting thru it quicker. Surfing looks like a dangerous sport, but it is not as dangerous as it looks, and as soon as one has learned how, there is very little danger if one is careful. One of the dangers from surfing is having your board thrown up into the air by the wave and falling on you. Another danger is having somebody else's board run into you. You must keep your eyes on what is happening every instant for this often happens. An important thing for a novice to remember is that when he is paddling out and there are a lot of fellows coming in on a wave, he should go perfectly straight and not try to get out of the way, for he usually will get right in some one else's way, for a person on a surfing board can judge very accurately whether he will hit a person or not, and steers accordingly. There is also some danger of getting in the way of a canoe which is coming in on a wave. The only thing to do if you have no time to paddle out of the way is to let your board go and dive, letting the canoe go over you. I have been run over three or four times by canoes, the last time I nearly got hit. There was a big surf and not many people out surfing. A canoe and I both started for the same wave. I was a little ahead, when I looked around and there was the canoe, which the steersman had lost control of, coming straight for me, and only about ten feet away. I let go my board and dove under as quickly as I could, just in time to see the canoe turn completely around over me. 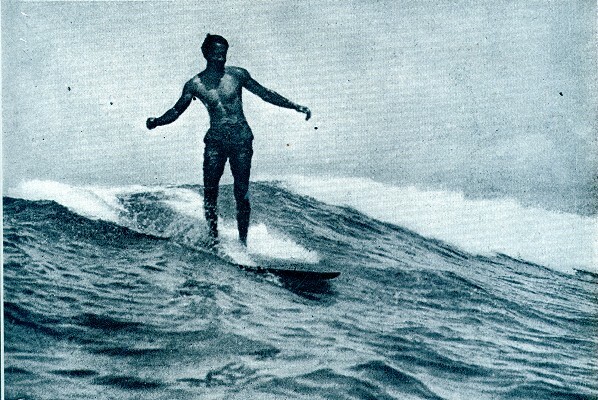 Jack London says that surf riding is a sport for the gods. old in a very small surf in front of the Aquarium and have kept at it ever since, and the more I go out surfing the more I like it. It is the same with most of the other boys of the Outrigger Club, for the same boys and many others also, who joined the Outrigger Club six years ago, belong to it today. 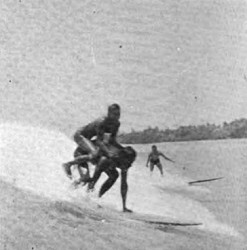 The club has fine surf-board riders and canoe-steerers too, most of whom are boys of fourteen to eighteen years of age. Although there is some danger, the fact that no one has ever been killed surfing at Waikiki speaks for itself. 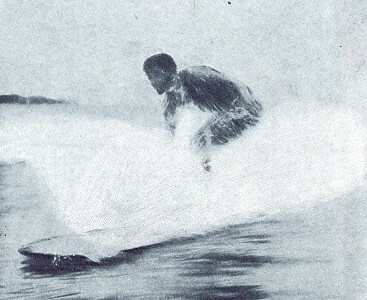 Geoff Cater (2017) : Lorrin P. Thurston : Surf-Board Riding in Hawaii, 1915.